When: Tue., April 30, 2-10 p.m.
Join us for a day of delicious cider and fun! 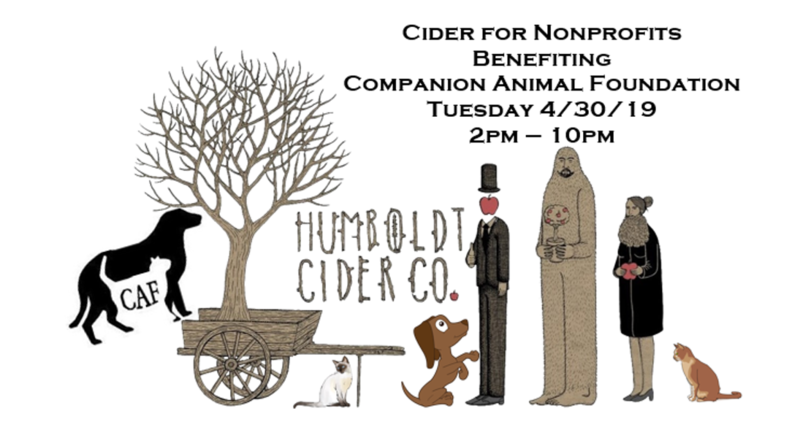 Humboldt Cider Company is hosting a Cider for Nonprofits event benefiting Companion Animal Foundation and our Mobile Veterinary Unit fund! There will be a 50/50 raffle, silent auction items, on-site pet tag engraving, homemade dog treats, organic catnip pillows and more CAF swag for sale. Best of all, every contribution you make will be going to benefit animals in need! 10% of tap sales on the event day will be donated to CAF for our Mobile Veterinary Unit fund. We look forward to seeing everyone there!